I got an early birthday present this week. My husband is getting me several things to 'make space' in my craft area which doubles as the guest room. He went ahead and gave me these so I could get a little of it organized. These 12x12 three drawer units from Wal-mart are wonderful for keeping matching papers and embellishments together in one place. 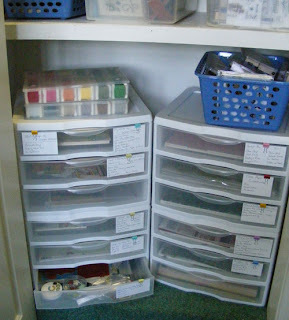 The drawers actually hold paper a little larger than true 12x12 so all my pattern paper has fit just fine. Each drawer is removable so I just take the entire drawer over to my work table when I'm ready to use a particular collection. I had two of these units and he got me two more. If I catty-corner them, I can fit two stacks in my closet and still open and close all drawers and doors. 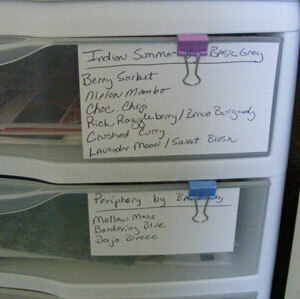 I write the cardstock colors that match a collection on a piece of scrap paper and clip them to the drawer front. Then it is easy to find what matches without pulling out all my cardstock. Thanks for stopping by. Be sure to visit tomorrow for TIPsy Tuesday. I have these as well and I love them.